after a day of lounging, cuddling pets, playing a rousing game of fetch in the back yard, reading, i took cody bear for a nice long walk along the river bank. his olfactory lobe is WIPED out. sooo many smells. as you can see, he is very pleased. made myself a tasty meal: summer squash and spinach in a garlic/white wine saucy situation. 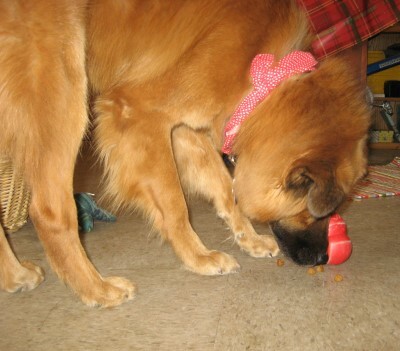 cody bear had his kibble in the molecuball and a bit of honest kitchen beefy yumyum. 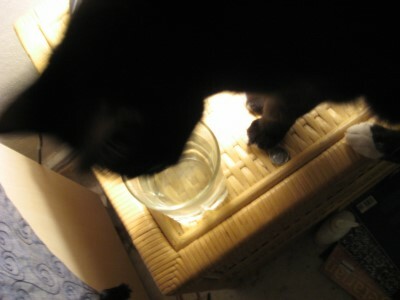 the cat…,well, she slept through dinner. we had a rigorous game with her new xmas toy so she is physically taxed, apparently. 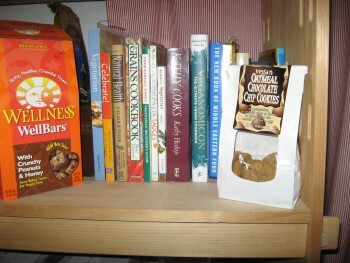 these are the trader joe’s vegan oatmeal chocolate cookies, and, whether you are a vegan or an omnivore…they are a “must eat”. after the cheese free pizza debacle, trader joe’s … back in my good graces. the biscuits are “wellness” peanut butter and they come highly recommended by my lovely canine pal. yes, that’s the cat….lounging. does that look comfortable at alllll? NO. 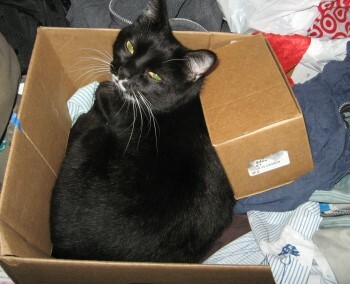 when cody bear and i returned from “gramma’s house” i dumped the box of gifts on top of some laundry and there it sat. it is close enough to the heater that she is willing to sacrifice softness. poor kitty. and….that’s just a refrigerator magnet. 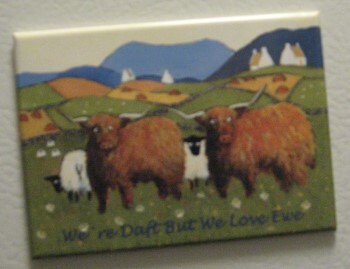 it says, “we’re daft but we love ewe” and see the sheep. hence the “ewe”. this was a trinket from my dear friend c on her last trip to scotland. i love it. love sheep. love scots. love magnets. so there you have it. all in all a peaceful day. no drama. good food. pet family goodness. got some stuff done. slept late. talked to some friends and family on the phone. for a wee moment, while i was looking at someone else’s more EXCITING and travel packed blog, i thought, “wow, i’m really boring”. she becomes very passive aggressive, and at times homicidal, if she does not have her scotch & water (sans the scotch) before bed. i am the chosen one. 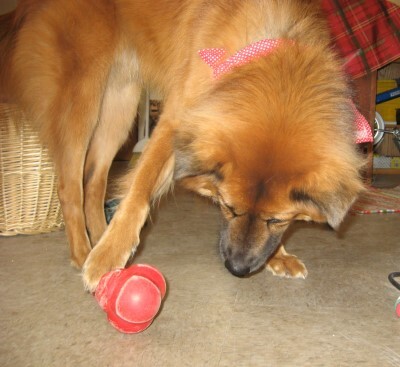 i must keep the kongs clean and full of chicken or peanut butter for the dog. ladies’ night out with r. not girls’ night out, mind you. it was ladies’ night because r. was wearing her pashmina and i actually wore my hair down instead of in ponies. and, it was ladies night out because the establishment was VERY posh. zero neon, mind you. 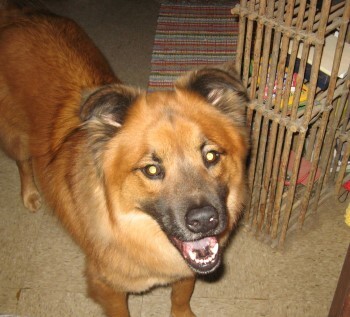 ummm….i did, however, take my cody bear for a super long walk in the cold as soon as i got home. and i admit, taking care of him and his crazy cat is fun. i had the hummus plate, which was yummy, but needed more olives. my beer of choice was fat tire. r. had the diablo fries, chopped salad and her beer was stella artois. r.’s slick move of the night: when asked what dressing she wanted….balsamic viniagrette on the side, AND ranch on the side. she then chris-crossed them BOTH on top of the salad. a BOLD condiment move, which i wholeheartedly respect! 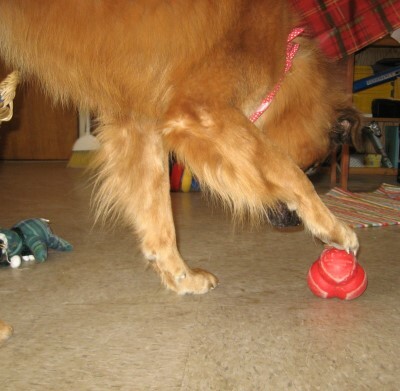 this is him playing with his “molecuball.” you fill it with kibble and they kick it with their paws or nudge it with their nose and kibble comes out one or two at a time. not only does he prefer this, because it is kind of a foraging game for him, i think it helps him with his gastroparesis because it makes him eat slowly and chew every bite individually…instead of scarfing it down. plus, its just so cute to watch him with it. one morning he was so excited, he gave the molecuball a play bow and then starting wagging at it while he began playing/kicking/nudging. since his condition is a motility problem, eating the food slowly helps him chew it more and makes it a bit easier to digest. as i mentioned earlier, i needed comfort food today (which is typically pizza) on my 21st day of veganism. (boo.) and my last post was written as the following pizza was toasting in the oven. typically i love trader joe’s. i do. but….well…. now, it wouldn’t be such a big deal: it being uglier than what the box promised and all. but, well, it was blah. very blah! i had a couple tiny slices because i was starved, and dipping them in a bit of olive oil and balsamic made it slightly palatable. i miss eating things i enjoy. 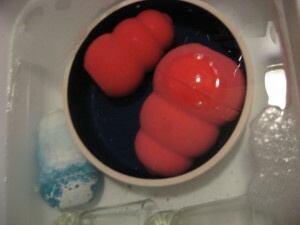 gooey things. so, cody bear and i are off to the bookstore to peruse vegan cookbooks. it might help if i new cows were rejoicing in field somewhere saying, “thanks! thanks for not eating us, or contributing to our suffering in anyway.” but they’re not…. …and i am starving for pizza. i got out of work 2.5 hours early! it was great because i had been wanting to take a nap since i woke up! i know that sounds lazy, but the cold weather is tiring me out. so i get home and cody bear is really excited to nap with me. he couldn’t mash himself into me any more than he was, i’m convinced. he was almost on top of me. so, tonight we’re going to take it easy. maybe go for a long walk, though it is already so cold it kind of hurts. it doesn’t bother cody bear though. he just bounces along on his walk like it is the perfect temperature. i want to move. i’m not sure i belong in this town. i’ve been here 6 years and am no closer to figuring out what i’m doing with my life. i have no idea where we would go though. we need a dog friendly town, obviously. and one with a high paying job doing who the hell knows what! vegan for 21 days now. today was the first real “oh, vegan schmeegan” day i’ve had. 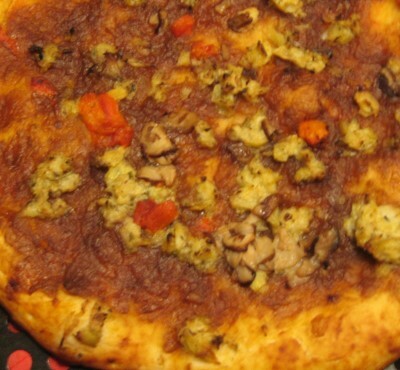 it may be because it is so cold and i want to fall back on my comfort foods, pizza mainly. 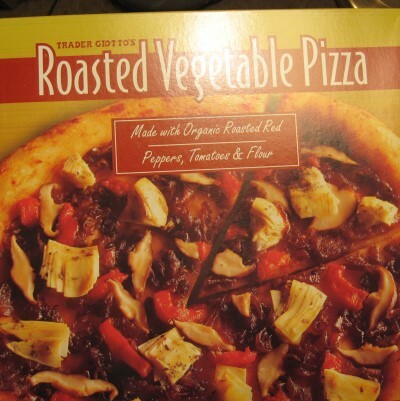 i just picked up a dairy free veggie pizza from trader joes. no soy cheese even. its in the oven now and it BETTER be good. …..i think i’m sort of bored with my life right now. i should be glad things aren’t terrible, though. well,….as you all know….it’s flippin’ cold outside. 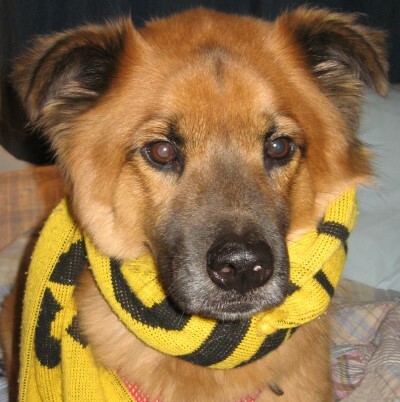 nothing says “it’s flippin’ cold outside” like the image of a dog in a scarf. now, i’m not one to dress my dog up in clothing. cody bear doesn’t typically dig the fashion scene. but, even he admits its cold outside and it would be best just to hunker down in a warm quilt with a loved one. 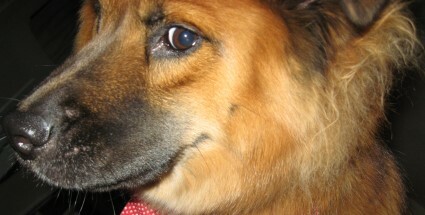 3. the father’s hope that taking the dog, lex, in will help the younger children develop a bond with animals. while i am a fan of peace and quite scared of war, i will say that hearing the tales of bravery of these dogs in iraq do not surprise me. it is my hope that people who don’t already love dogs will see that they are thoughtful, devoted, intelligent and amazing members of our community. please share any articles/links you may have that illustrate dogs’ beneficial roles in society with me, from pet therapy, to police dogs. from mold sniffers to tricksters to athletes. have a good life with your new family lex!